Publisher: F.W. Salem & Co., 1880. Reprint Edition, BeerBooks.com, 2007. Soft Cover, 275 pages, 6.26 x 9.25. In 1880, American writer Frederick W. Salem published a book which he titled Beer: Its History And Its Economic Value As A National Beverage. Just at that time, the U.S. brewing industry was at a vital crossroad. Anti-alcohol factions (referred to as "the fanatics" by beermakers) had evolved into a significant threat to the industry during the decade just ended. Yet, at the same time, there was good reason for optimism among brewers. Their collective output had climbed steadily year by year, and an exploding immigrant population  comprised largely of beer-drinking Europeans  brought the potential for unprecedented growth. In 1880, brewing in America was destined either to become a great industry, or the casualty of social activism. Recognizing that their future hung in the balance, brewing industry leaders went to work. Through the United States Brewers' Association, beermakers launched a campaign to sway public opinion in favor of their product and against their enemies. 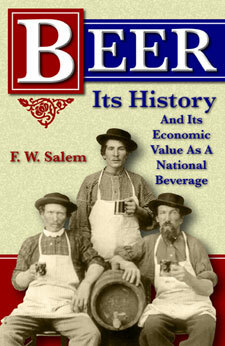 Author Frederick W. Salem was among the many friends of beer recruited to help defend it. And that he did. 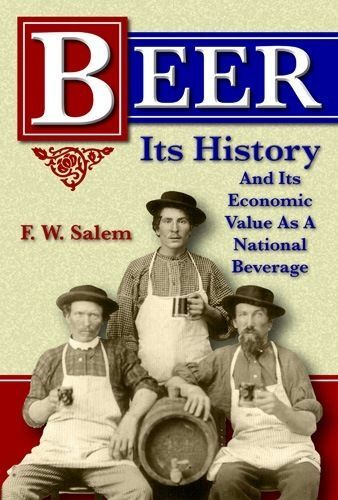 While dutifully professing "the true nature and value of beer," Salem's book captured and reflected the pervasive confidence among brewers that their industry was on the cusp of spectacular growth, and that beer would, indeed, become America's national beverage. To make this ultra-rare brewing text available to historians and beer enthusiasts, BeerBooks.com has reprinted the book, complete with all the original illustrations. A first-edition 1880 copy was digitally scanned, professionally enhanced and reproduced in a hard cover format. The extensive statistical data alone makes this book a great resource -- particularly the complete list of every licensed brewery in the U.S. in 1878 and 1879, arranged by state/city, along with each brewery's individual beer production for both years. But, there is so much more! Make sure to read the Table of Contents and the excerpt from Chapter 7 below.  The Sunday Question in Newark, N.J.
His success induced another German to try the same experiment on a small scale in the city of New York, and from this insignificant beginning the business has increased to its present immense proportions, so that there are now according to the latest return of the Internal Revenue Department at Washington, no less than two thousand eight hundred and thirty ale and lager beer breweries in active operation. The number is in fact considerably larger than that given by the Department, owing to the method of returning only those in actual business at the beginning of the year and to other causes. The annual product according to the Department figures, is over three hundred million gallons. More exactly the figures are, 303,147,552 gallons, or 9,473,361 barrels. In addition to this there are numerous private breweries where beer is made for home consumption but not for sale, and these do not fall under the Internal Revenue regulations and are consequently not reported. Figures are given below in reference to the capital invested in the brewing, malting and hop business, and taken after careful investigation from the best sources attainable, will give the reader a faint idea of its vast extent. » Table showing capital invested in 2,830 breweries and 485 malthouses in the U.S.
» Table showing number of laborers employed and wages paid in brewing, malting, barley culture, hop culture, and related industries. A glance at the figures just quoted is enough to show that this branch of industry has become very important. Such a production implies the contribution of a large amount of capital, and after careful investigation of the most trustworthy data we find that there are more than three hundred million dollars invested in breweries, malt-houses and other adjuncts of the manufacture of beer in the United States. The direct investment, however, is not the only thing to be considered. A business of this magnitude furnishes occupation not merely to vast numbers of laborers, but also to thousands of men who follow some profession or trade, such as architects, civil engineers, masons, carpenters, coopers, coppersmiths, wagon and harness-makers, and the like. The following table exhibits the production of the various states and territories for the last year, together with the increase and decrease as compared with the previous year, and also the amount of the brewers' manufacturing tax collected. » Table listing each U.S. state/territory along with its number of barrels of beer produced in 1879, its increase or decrease from 1878, and the amount of taxes paid by brewers. The percentage yielded by the several leading states to the total government income from malt beverages during the last fiscal year is shown in the following table. » Table listing the largest beer-producing states along with the number of operating breweries in each state, and its percentage of contribution to total U.S. beer taxes. » Table showing the breakdown of beer packaging into hogsheads, barrels, half-barrels, quarter-barrels, third-barrels, sixth-barrels, and eighth-barrels. Enormous as the above figures may seem we are to remember that a great majority of the breweries in the country have been erected within the last fifteen years, and it is certain that no other branch of industry can show equal progress during the same time. The following tables, showing the imports and exports of beer for the past few years, demonstrate the strong position American beer is taking at home and abroad. The imports decrease. The exports increase, and this is the best proof that our brewers produce an article which is equal if not superior to the foreign, and we have no doubt that with the help of wise laws they will soon be enabled to compete with those of any nation and thus not only enrich the coffers of the United States Treasury but add in other ways to the welfare of our great country. » Table showing amount of beer imported into the U.S. for each year from 1872 to 1878, in gallons and dollar value. » Table showing amount of beer exported by U.S. brewers for each year from 1870 to 1878, in bottles and casks, showing dollar values for each. It will be seen from this table that whilst the export of beer in casks has not considerably increased, the increase in the export of bottled beer has been very large. In 1870 we exported 1,076 dozen bottles, and in 1878, 76,475 dozen! This trade has especially been encouraged by the Philadelphia Centennial Exposition, as it enabled us to show to the world the quality of our production. The gigantic establishments that, in many cases cover entire city blocks, are monuments of very lucrative enterprise and ought to be the pride of the American people. The truth is, that, notwithstanding a yearly sale of more than 300,000,000 gallons, the consumption of beer is yet in its infancy. With an increasing number of persons it ceases to be a luxury and takes rank with the other articles of daily food. The demand for it in all parts of the United States is increasing so rapidly that existing breweries are enlarged and improved, and new ones are springing up in every direction. In Appendices D, E and B will be found a list of breweries in the United States with the names of proprietors and the product of each, together with the total product by States, as also the production per capita in the various countries of Europe, the total production in the same countries, and the number of breweries in each, and we trust that these tables will not only be of service to the trade and to students of this question, but also serve to give some prominence to the men who have done much for the advance of genuine temperance and who deserve a more substantial recognition than any it is our power to give. All this progress is a natural result of the actual benefits beer has bestowed on mankind, and these again follow logically and as might be expected from its constitution, containing as it does a large portion of water from which all organic impurities are eliminated, a certain quantity of nutritive malt extract and a very small percentage of pure alcohol, obtained by fermentation and entirely free from the injurious properties it acquires in distillation, together with some of the carbonic acid gas so thoroughly approved by consumers of soda water. It offers to the public a beverage at once healthy, nutritious, and mildly stimulating, and as refreshing and exhilarating as tea, coffee or cocoa. Those who travel know very well the injurious effect of a change of water. In no two districts are the waters alike, and we could point to many instances where removal from East to West or from North to South and the consequent change of water has resulted in disastrous effects upon individuals. Any inconvenience of this sort would be diminished or altogether avoided by means of a free use of beer. Another similar advantage of beer is mentioned by Joseph Coppinger in his work on brewing, called "The American Practical Brewer, etc.," published in New York in 1815. After recommending new ale as a preventive and yeast as an antidote to malarial fever, he continues: "Brewing, in every country, whose soil and climate are congenial to the production of the raw materials, should be ranked among the first objects of its domestic and political economy. But a still more important consideration is the health and morals of our population, which appears to be essentially connected with the progress of the brewing trade. In proof of this assertion, I will beg leave to state a well-known fact; which is, that in proportion as the consumption of malt liquors have increased in towns, in that proportion has the health of our fellow-citizens improved, and epidemics and intermittents become less frequent. In the country it is well known that those families who make frequent use of good beer during the summer, are in general healthy, and preserve their color; whilst their less fortunate neighbors, who do not use beer at all, are devoured by fevers and intermittents. These facts will be less doubted when it is known that yeast, properly administered, has been found singularly successful in the cure of fevers." The views thus expressed more than sixty years ago have recently received much attention and are now advocated by many eminent authorities who hold that they are confirmed by both fact and theory. The sum of the whole is that the beer brewing business has within a short time increased immensely -- and strictly on the more general recognition of the merits of the product -- and that there is every reason to anticipate at least an equal increase in the near future. Beer is already taking the place of ardent spirits and mixed drinks, and not long ago there appeared in the New York Sun the complaint of a bar-keeper who said in substance that the occupation of a skilled compounder of fancy drinks was gone, for anybody could draw beer and beer was what everybody wanted. Large gatherings now are more orderly than a few years ago and the reason is to be found in the general use of beer instead of whisky. At Coney Island the proprietors speak of the change as wonderful, and say that but for beer they could not get on, while now a disorderly occurrence is rare, no matter how great the throng. The same thing may be seen at the various races and in all such great assemblages of people who gather for enjoyment, and under the old regime were sure to become riotous.